Each year, our Spokane Hoops Association office staff huddles up with sponsors to determine the best ways to improve the world’s largest 3on3 basketball tournament. In order to ensure the integrity of our event and mission of our organization are upheld year after year, we align ourselves with like-minded businesses. Our new media partners will help us elevate the last weekend in June, and this year we’ve got a whole lot of excitement coming at you. Spokane Hoops Association is excited to announce our partnerships with KHQ and SWX, iHeartRadio and 1-Stop Media! Our teammates over at 1-Stop Media have been working hard to bring relevant, trendy and engaging hoops content to our social media accounts. Since January 2018, Allison Sattin and her crew are curating content and learning more about our organization’s various events and programs to continue to inform our audience. During our tournament weekend, 1-Stop Media and our Digital Street Team will be on-site to capture all the 3on3 action, contests and competition and overall energy of the event. If you just can’t wait to get a glimpse of what 1-Stop does for us, then let’s get social! We’d love it if you followed @SpokaneHoops and @SpokaneHoopfest on Facebook, Instagram and Twitter. Another new addition to our squad is KHQ. You might have already seen a few commercials produced by Q6 in the PNW highlighting our General Volunteer and Court Monitor Registration! 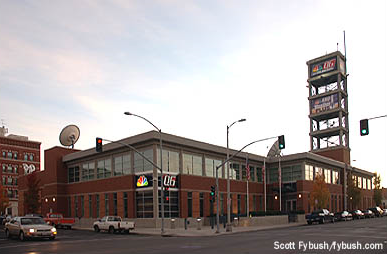 They’re the station that brings you SWX, the Inland Northwest’s Sports and Weather Channel, which will be stationed in the middle of all the Hoopfest action at Nike Center Court. Throughout Saturday and Sunday, SWX will be broadcasting live games and providing score updates. This guarantees that you’ll know what’s happening no matter where you are during the Best Basketball Weekend on Earth. “With SWX’s robust crew, we’re confident they’ll capture our tournament weekend and have a positive impact on our Hoopfest footprint,” Morgan says. Now that KHQ and SWX, iHeartRadio and 1-Stop Media are officially on our team of great sponsors, we’re confident that #Hoopfest2019 is going to be another one to remember! Have a little bit of FOMO (fear of missing out)? Then check out our Sponsors page on our new website for more information on how to be a part of our team!